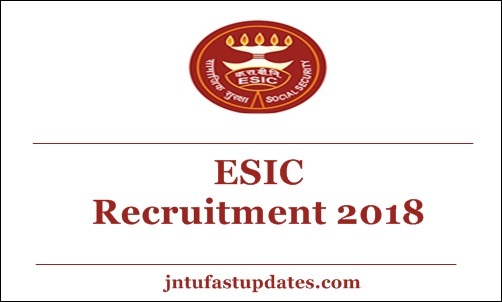 ESIC SSO Recruitment 2018: Employee’s State Insurance Corporation has invited ONLINE Applications for filling up the post of Social Security Officer/ Manager Gr-II/Superintendent on regular basis by Direct Recruitment in ESIC. Revised pay as per 7th Central Pay Commission for the post is Level- 7 of Pay Matrix (Civilian employees) with Entry Pay Rs 44900/-, replaced against Pay Band Rs. 9300-34800/- with Grade Pay Rs. 4600/- of 6th Central Pay Commission. The selection will be done on preliminary and main examination. 1. Candidates to go to the ESIC website www.esic.nic.in and click on the option “APPLY ONLINE FOR RECRUITMENT TO THE POST OF SSO-2018 IN ESIC ” which will open a new screen. generated by the system and displayed on the screen. Candidate should note down the Provisional Registration Number and Password. An Email & SMS indicating the Provisional Registration number and Password will also be sent. Impaired candidates should fill the application form carefully and verify/ get the details verified to ensure that the same are correct prior to final submission.